On a desktop PC, the GND signals of the USB ports are usually on the GND level of the electrical installation in your building. 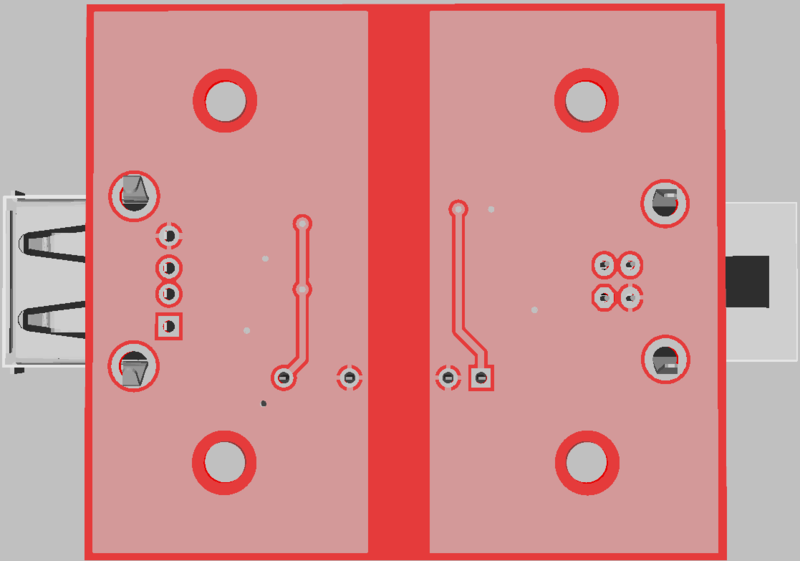 So even if the USB device has an isolated power supply and would be isolated from ground, this isolation is bypassed by the USB connection. There are scenarios where this is not desired, e.g. 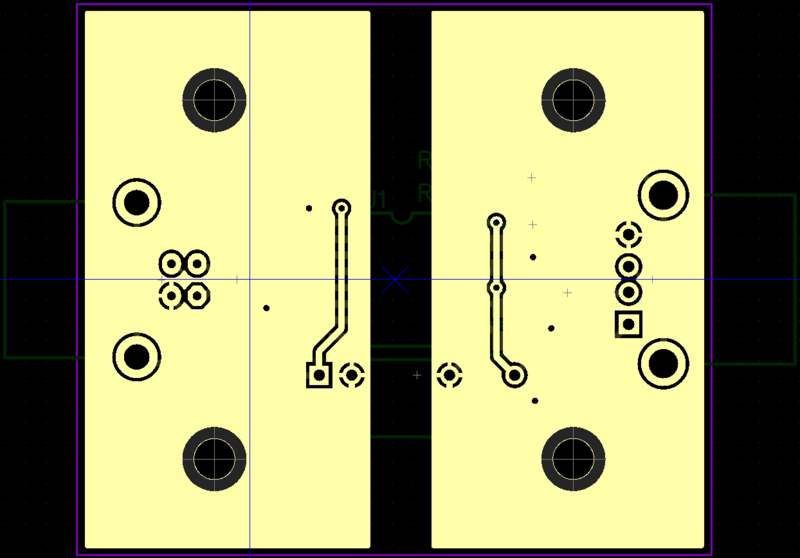 it can be necessary for measurement devices to use some potential in a circuit as reference instead of the common ground. Besides, the direct connection of 5V and GND lines between an USB device and your PC is also problematic in case of electrical faults of the USB device. E.g. if a catastrophic short circuit happens in the measurement device, this could damage the PC. 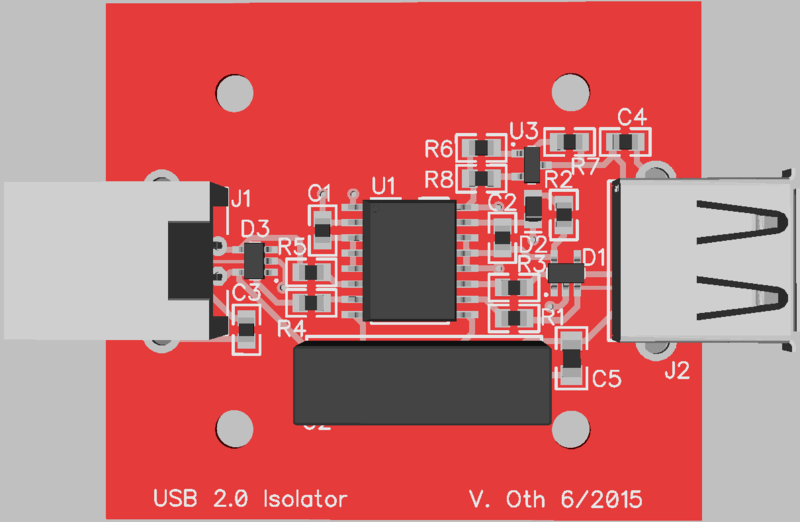 So there are good reasons to use an USB isolator - it's just that they are usually quite expensive. Also most of them can't supply a connected USB device. Typically, you need to connect a power supply on the USB slave side (behind the isolation barrier), which is not very handy. The idea was to create a relatively cheap (material cost around 20€) and simple USB isolator which fits into a small and cheap off-the-shelf case and which is able to supply a slave directly. The decision regarding the isolator was pretty much straightforward, as the ADUM3160 digital isolator from Analog Devices is more or less the only easily available solution. It supports low (1.5MBit/s) and full (12Mbit/s) speed and can withstand a voltage difference of 2500V (rms) for one minute. To be able to supply the USB device, an isolated 5V to 5V 2W DC/DC converter is added which is able to deliver 400mA at 5V. Now this would be straightforward if these DC/DC converter modules would be regulated, but they usually aren't. Typically an isolated DC/DC only keeps its specified output voltage with a minimum of 10% load. I.e. 40mA for a 2W device and a 400mA maximum continuous load current. Since Zener diodes are temperature dependent, not very precise and you can't get them for any voltage, a shunt regulator TS431CX is used. It has an internal 2.5V reference and the output voltage can be configured with two resistors. However taking into account the efficiency of the DC/DC at low currents, the current into the USB isolator will be even higher (43% higher assuming 70% efficiency). Actually, I did some measurements with a Recom RKZ 0505S. 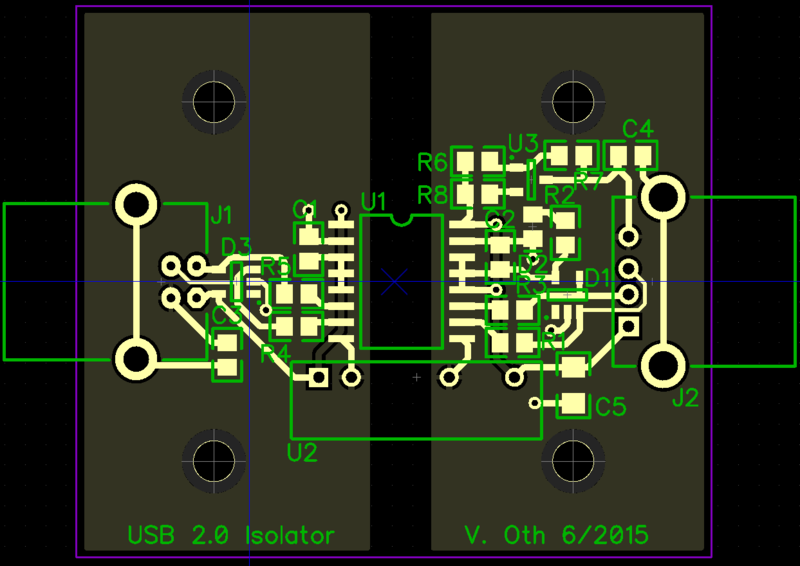 The data sheet lacks any information about an idle current, but I measured 32mA at 5V. Without any load (or external regulation), the output voltage is as high as 6.6V. The ADUM3160 needs around 2mA in idle mode. The LED takes around ~5mA which however results in ~7mA on the input side due to the bad efficiency of the DC/DC at low currents. In sum, we can expect an idle current of at least 41mA for the whole circuit without the regulation in place. For the full circuit, I measured an input current of 62mA in idle (with 5V supply - on my PC it was just 52mA due to slightly lower voltage). Subtracting the expected 41mA that are not related to regulation, that results in 21mA flowing into the circuit due to regulation. However, the efficiency of the DC/DC has to be taken into account to estimate the current drained by the shunt regulator. With an assumed 70% efficiency at low loads, it's probably around 13mA. Then again, the voltage drop on the 75Ohm resistor can be measured directly to determine the current. With a 5V USB voltage I measured a 1.3V drop which means 17mA. For the slightly lower USB voltage on my PC I measured a voltage drop of 1.1V which means a current of ~15mA. So there's no need to worry about the 75Ohm resistor since the current needed to get a stable 5.25V output is only around 15-17mA which means 17-22mW at the resistor. A quick look with a thermal image camera shows nothing unexpected. 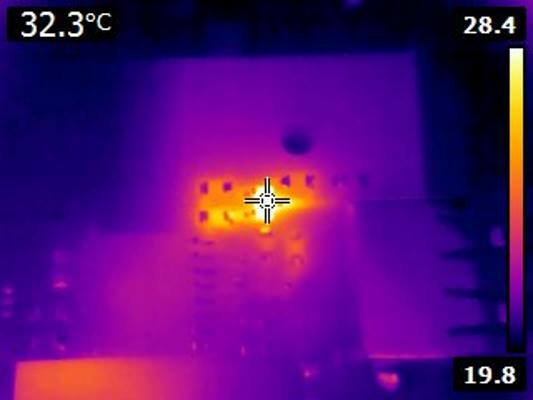 The TS431 gets a bit warmer (32°C) but the 75Ohm resistor is just slightly above room temperature. I decided to use an USB-B connector on the host side and USB-A on the slave side - mainly because 90% of my USB cables are just like this. The case I selected is a Hammond 1593K . It's available in different colors, e.g. in black and transparent blue. I created a CAD drawing of the front/back panels to be able to get them cut from acrylic at Formulor, but for the moment I just used a drill and file to get the holes done.